What we and so many other businesses large and small do, when selling on line, is governed by the EU and UK Distance Selling regulations. Distance Selling is a term that few of us will have encountered until twenty years ago but basically it provides consumer protection for mail-order and, more particularly these days, internet business-to-consumer sales. 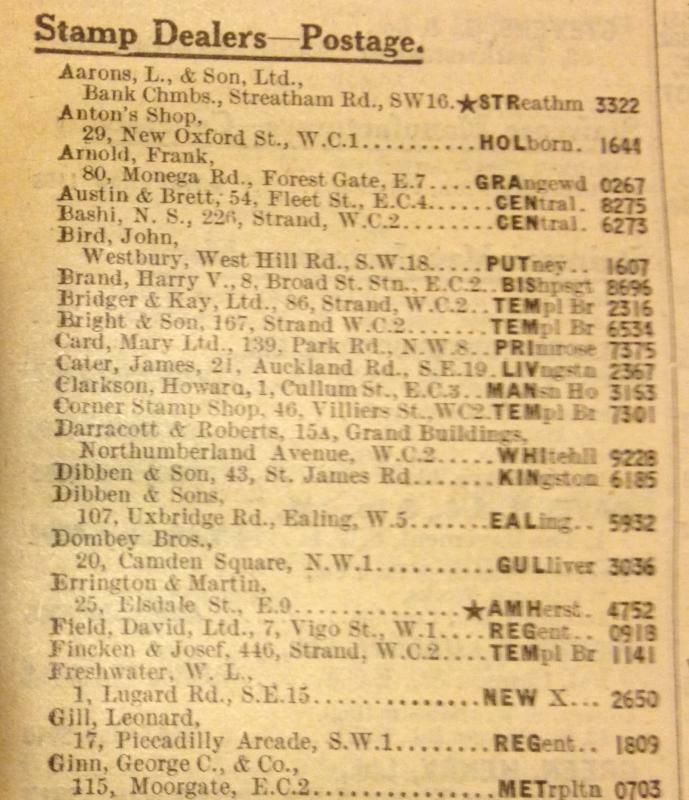 Now Royal Mail is marking 350 years of Distance Selling with an online gallery of mail-order catalogues. 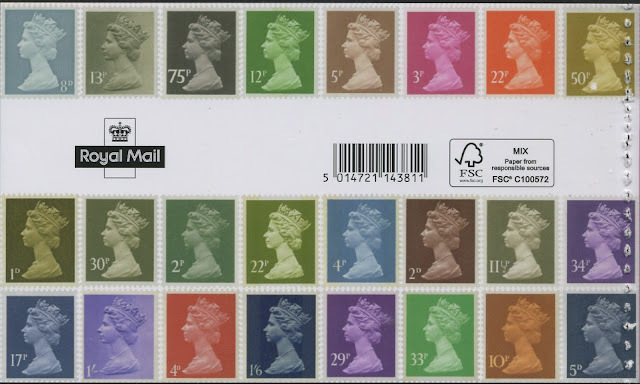 Apart from the very oldest, this is limited to just a few companies and is of minor interest to philatelists although postal historians - and especially thematic collectors - could build up a collection of advertising and logo'd envelopes. 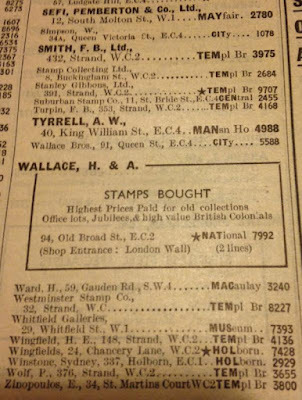 More relevant are the many mail order stamp catalogues, not only from the bigger names like Stanley Gibbons and Urch Harris in the UK, Scott and Mystic in the US, but others who produced catalogues primarily for selling their stamps, such as Whitfield King of Ipswich. 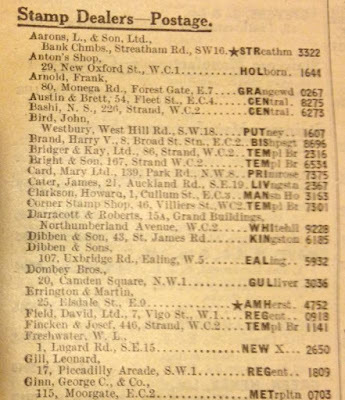 I don't have any old catalogues, but I do have the 1939 version of the GPO's London Yellow Pages telephone directory which lists a number of stamp dealers whose names will ring bells with some readers! Wow! 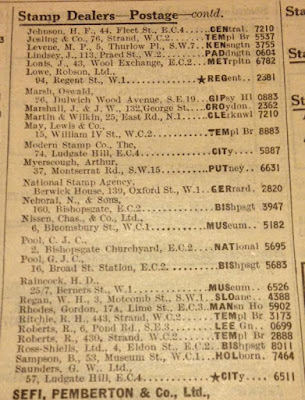 Your blog certainly aroused my childhood memories of visiting "Dibben and son" stamp shop in Kingston from around 1953, having been pointed in their direction by our primary school teacher who had just started up a school stamp club. This was a real treat for 8 year old boys, as we were treated like kings by Mrs Dibben and her staff, even if we only had six(old)pence to spend! Apart from the stamps, I remember buying my first reduced price stamp catalogue, "The Two Reigns GB". 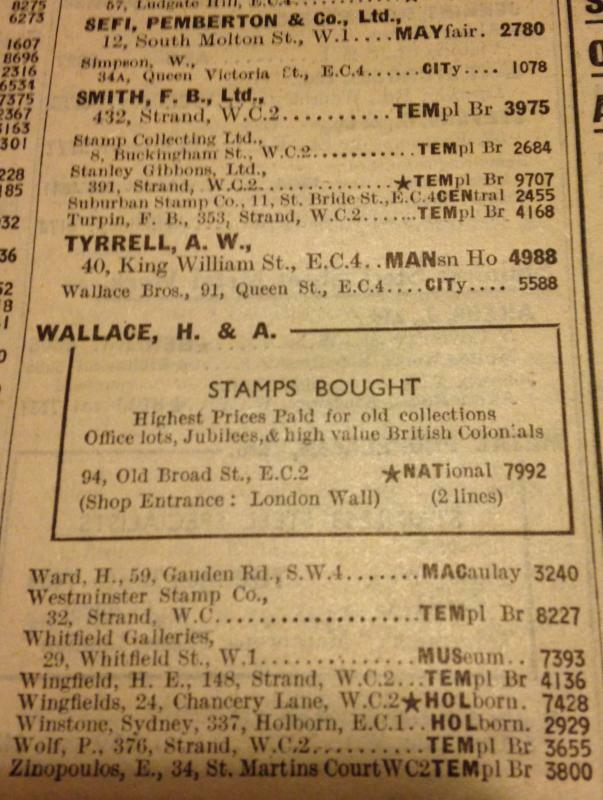 What joyful memories of the early days of my 63 years stamp collecting hobby. 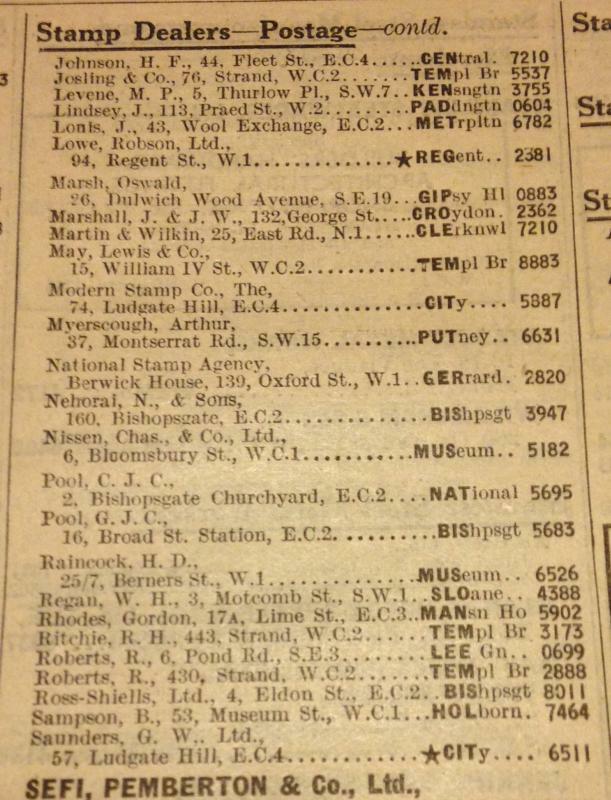 I was too young to go up to the city from Wood Green (N22) when we lived in London, but when we moved to Chelmsford I spent a lot of time in a stamp shop in a side street near the Corn Exchange (I think). It was having that sort of access, instead of Woolworth's 6d packets, which helped foster my 61 years with the hobby! I still have my first album, though now stripped of most of its stamps. 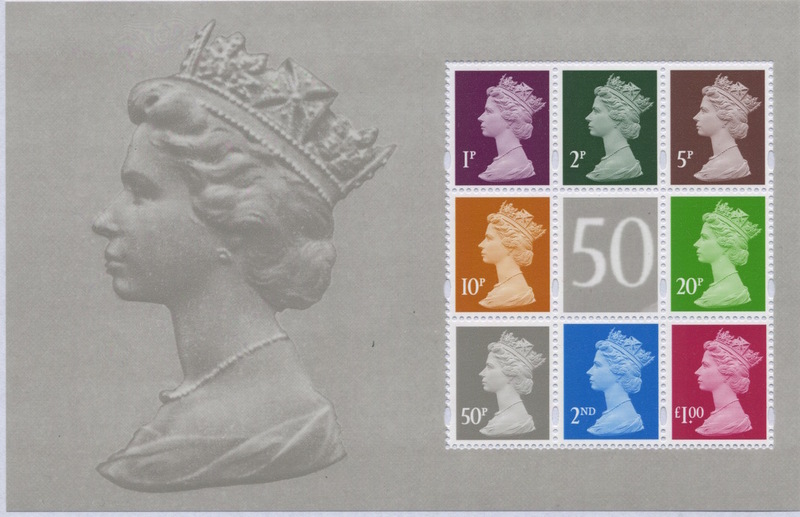 Thank you for your patience while we undertook a comprehensive stock check and top-up of the most recent stamps. Some items remain out of stock because we just can't find any more, but we have added the Machin 50th Anniversary products including a selection of first day covers, and some more Machin Business Sheet Tops. We will be on holiday from June 1 - 17, so no Anniversary products will be despatched until week commencing June 19th. Because of this you may wish to order and delay your payment until our return. In this case choose any payment option other than Card or PayPal. We have prepared a number of first day covers and they are at the Royal Mail Philatelic Handstamp Centres for processing and return. If you chosen FDC is shown as out of stock, please email us and we will try to obtain more. The easiest way to obtain all the stamps issued as part of this commemoration is to buy the Prestige Stamp Book and the Golden Anniversary MS. Depending on your degree of specialisation the book contains between 10 and 22 new stamps, the only duplication being the 2 x 20p double-headed stamps, and the 4 x £1 gold. We realise that if you buy the book to break up you may not want the duplicates, especially if you are not in the UK and cannot use the extra £1 stamps for postage. For this reason we are offering the book with only one £1 stamp at a reduced price, as this saves us a lot of time in breaking the book up into individual stamps. Use the option 'Reduced book'. 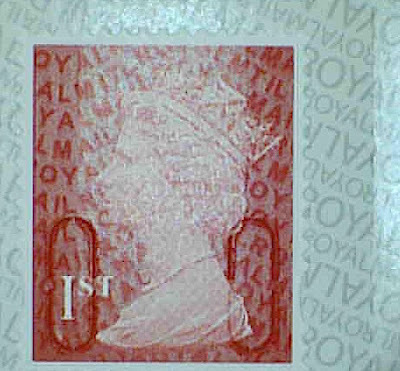 At this stage the only single stamp we are offering is the 1st class deep scarlet MSIL stamp from the retail booklet. 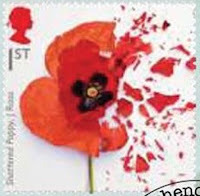 Depending on feedback we may sell other stamps singly in due course. And while you are in Machin Anniversary mode, take a look back to the FDCs we produced ten years ago. Some of these are still available. 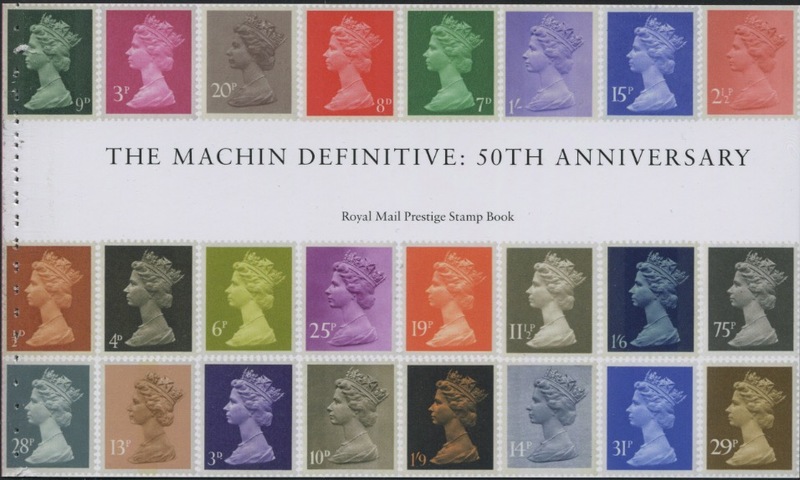 Although most serious collectors of Machin definitive stamps will be aware of much of the background to the design, and the work that went on before the first stamps were issued in 1967, and the many developments that have taken place since then, the Prestige Stamp Book usefully brings all this together. 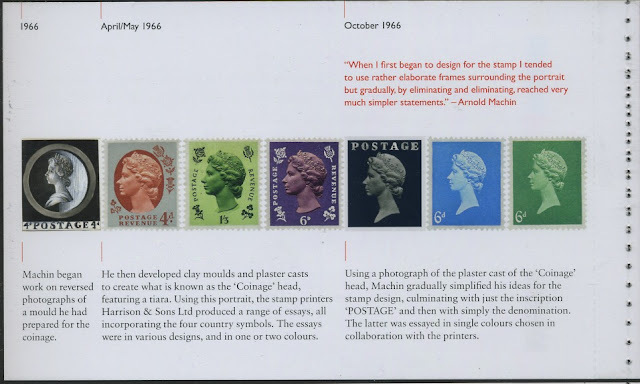 The book has 12 non-stamp pages of text written by Richard West MBE, former editor of Stamp Magazine. 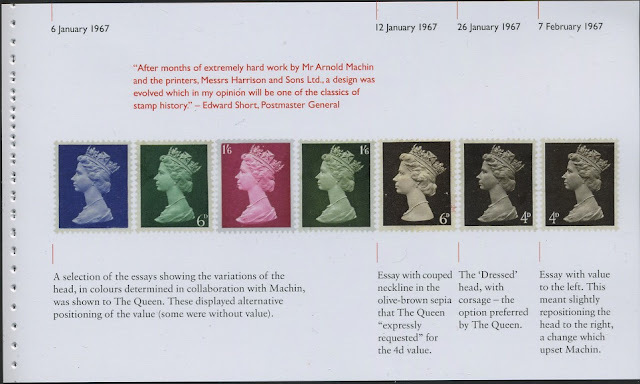 Page 1 shows Arnold Machin (the portrait used for the 2007 1st class stamps in the miniature sheet and smilers sheet), with sketches which included four different portraits. 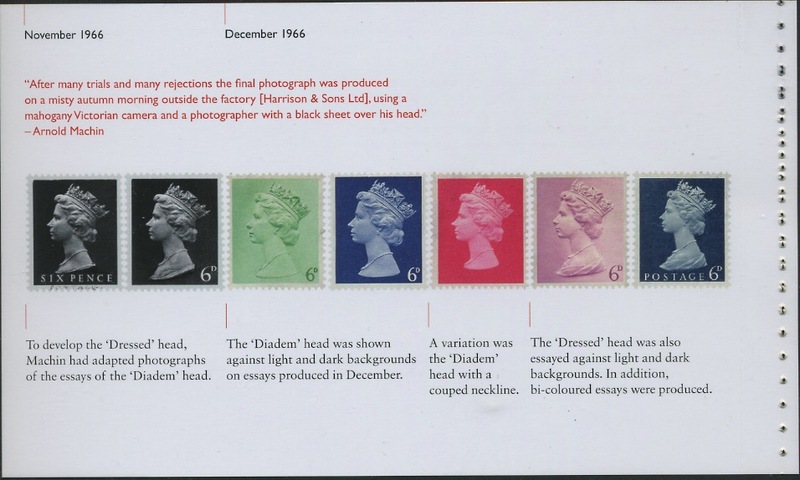 Page 2 shows further designs based on photographs of the coinage head mould. Page 3 introduces the new photograph by John Hedgecoe, from which followed a new plaster cast, giving rise to further essays. 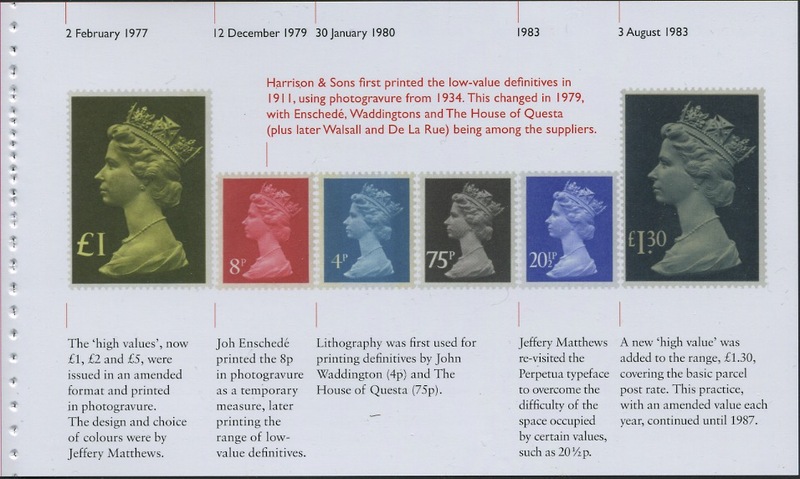 Page 9 takes us through to the new larger photogravure high values, the first stamps printed outside the UK, and in lithography by Waddingtons and Questa. 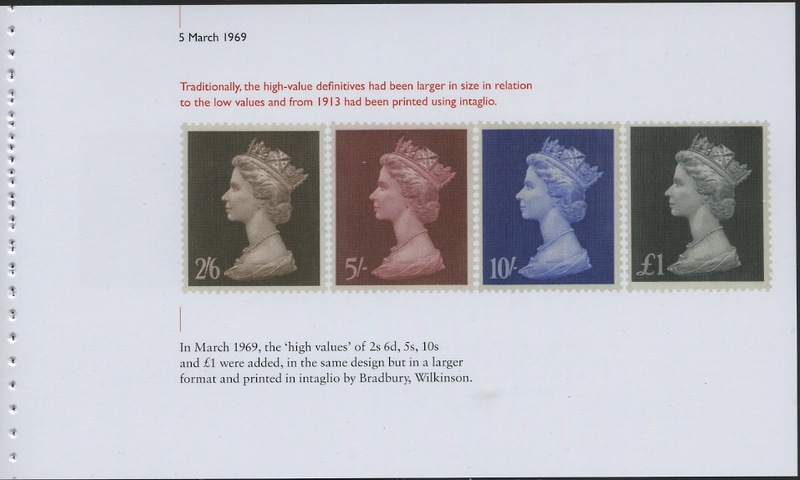 Page 10 brings NVI, 1990 double-head, elliptical perforations and self-adhesive stamps. 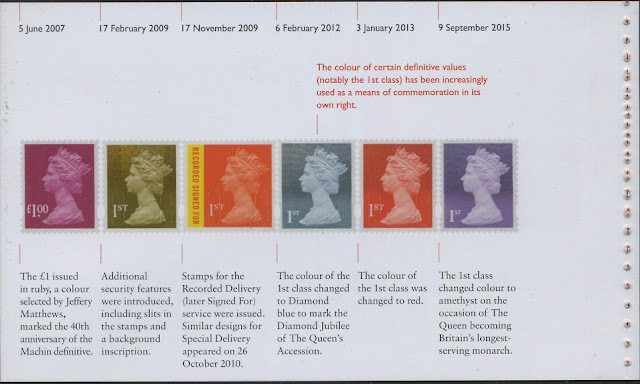 The small recess-printed high values, Millenium 1st class, Airmail and PIP stamps are shown on page 11, while page 12 brings us up to date via the £1 ruby introduced for the 40th anniversary, the security stamps of 2006, Recorded Delivery stamps, the 1st class stamps for the Queen's Diamond Jubilee and Longest Reign, and the change to Royal Mail Red. It is good to note that the gold security stamp has no year or source code. 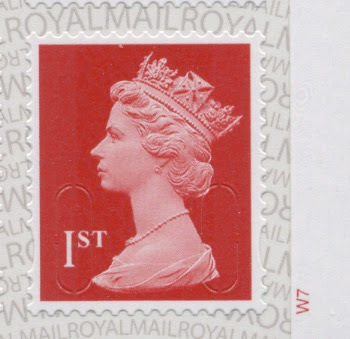 The Diamond Jubilee and LTROU stamps are copies of the actual stamps unlike so many of the illustrations used by Royal Mail elsewhere. These two have no security slits indicating that they were taken from the miniature sheets: the codes are not visible. 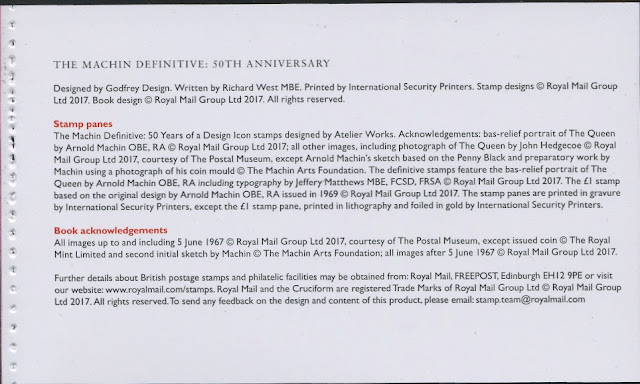 The inside back cover includes all the technical information including that the stamp panes are printed in gravure except for the pane of 4 x £1 gold foil stamps, "printed in lithography and foiled in gold" by International Security Printers. The outer covers show a selection of decimal and pre-decimal issued stamps in their original colours. 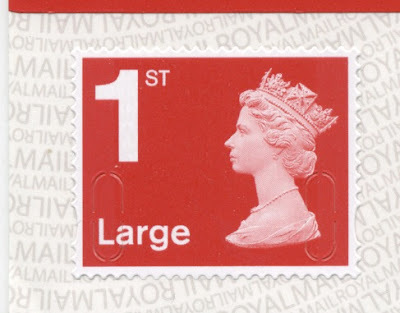 After the rush of postmarks during March and April there have been very few special slogans during May and most offices are using a Postcode slogan or in some cases the Stroke Support slogan. I was looking for a full list of the finalists, but all I can find is a list of local finalists 5 for each of the 24 regions. If you search Google news, you can see some of the designs. It seems that Royal Mail has a new charity partner, so we should soon see slogans declaring their association with "Action for Children", replacing that linking them to The Stroke Association. Not much left of May now, but still time for more slogans, so let us know what you find and we'll report them here. The first surprise is that one of the PSB panes is quite different to the pre-issue publicity picture that we were sent, which subsequently appeared in the Royal Mail Philatelic Bulletin. The change introduces a new stamp and eliminates some of the duplication. Larger images of some of these products can be seen on our new webpage. This sheet contains six new stamps showing the development of the Machin design from the design inspired by the 1d black, through to what was almost the final design. 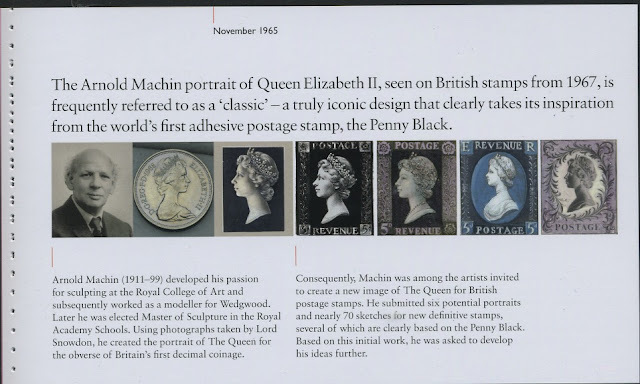 The Machin head which is common to each stamp is embossed, as is the plaster cast portrait in the margin. 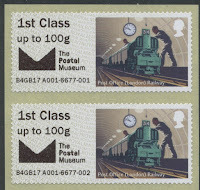 Detail of the designs on the stamps is on our website. 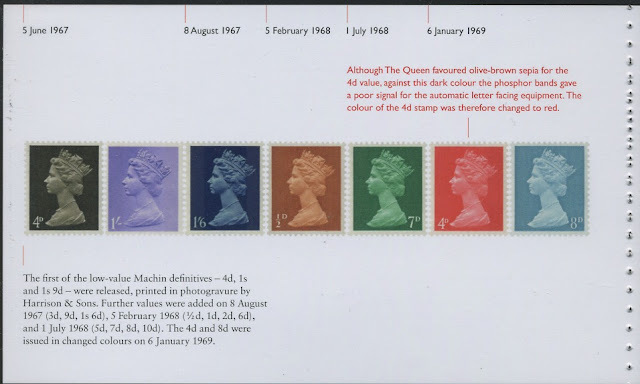 5p violet (1971), 20p black double-head (1990), 1st class orange (issued in 1993 as the first self-adhesive booklet), 1st class Millennium (2000), 1st class gold Pricing in Proportion (2006), 1st class red (2013), and a new £1 stamp based on the high-value range of 1969, printed using gold foil. The Prestige Stamp Book contains five panes of stamps. 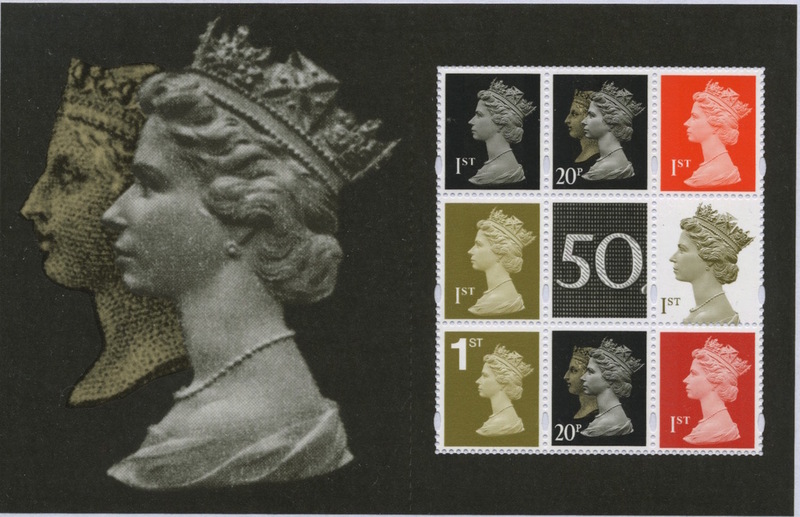 The first two have three each of the Design Icon stamps*, and pane 5 has a striking block of 4 gold foil £1 stamps. But the other two panes contain 8 Machin definitives each, in various designs. *As these are separated onto two panes in the PSB they will be catalogued as individual stamps. Pane 3 has eight stamps and is described as having the 'make-up' or supplementary values. These are 1p, 2p, 5p, 10p, 20p, 50p - plus 2nd class and £1 ruby. 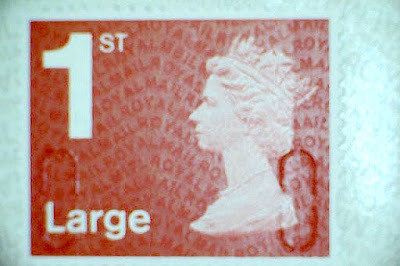 The 50p grey and £1 ruby are not in the current colours, but in the colours first used in 2007. Odd then that the £1 ruby - and only this stamp - has iridescent printing, coded M17L MPIL. 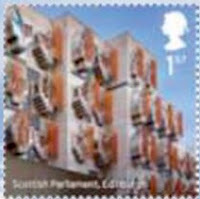 The central label is a detail from the 50p stamp. Pane 4 also has eight stamps. Aside from the 20p double-headed stamps (the pane contains two of these rather than three as shown previously), all the others are 1st class. 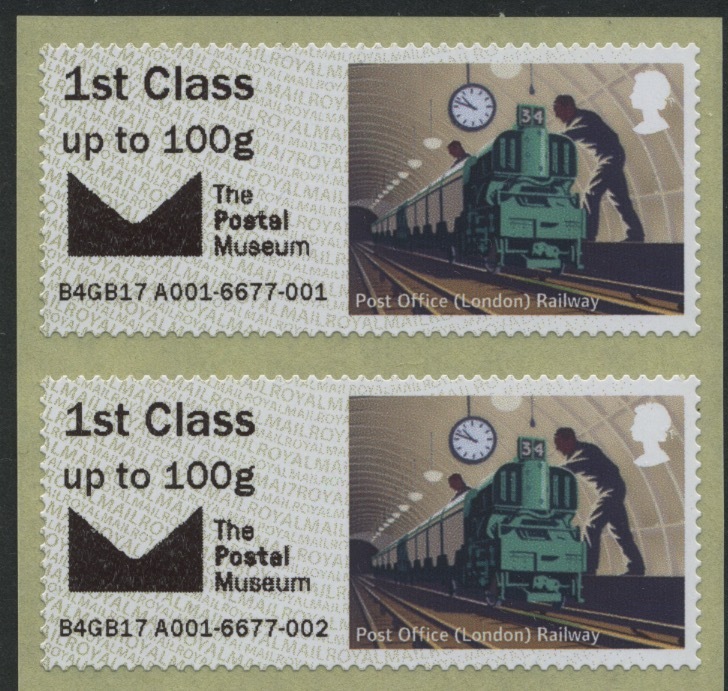 (Another odd decision given that the 1st class double-head stamp exists from the Special by Design PSB and the 2009 Treasures of the Archive PSB (SG 2133 and 2956 respectively). 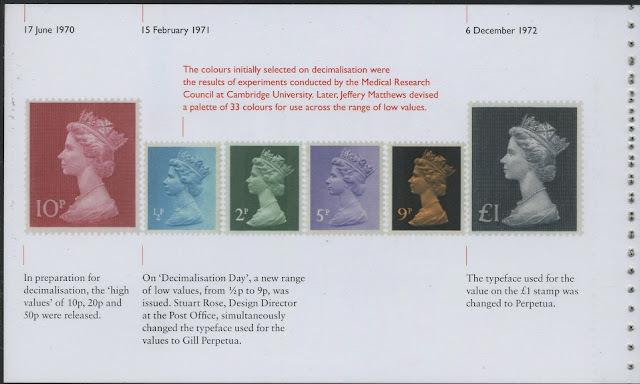 There is also a retail booklet as unimaginative as the one produced for the 40th Anniversary; the security coding is M17L MSIL and the stamps are deep scarlet, not as shown in this publicity picture. List of the stamps contained in the retail booklet, the Golden Anniversary MS and PSB panes 3-5. Table updated 14 December. Highlights in green are new stamps, SG numbers are now shown where they have been allocated. 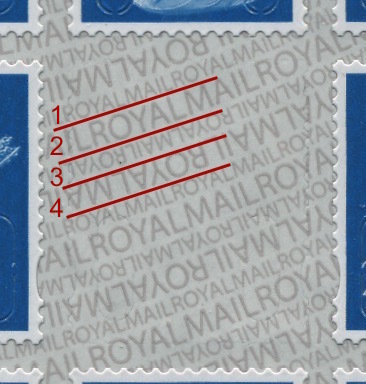 Responding to a request for clarification Royal Mail have said that both £1 stamps are the same, ie gold foil embossed and neither litho nor gravure. See also comments below, on other variations. 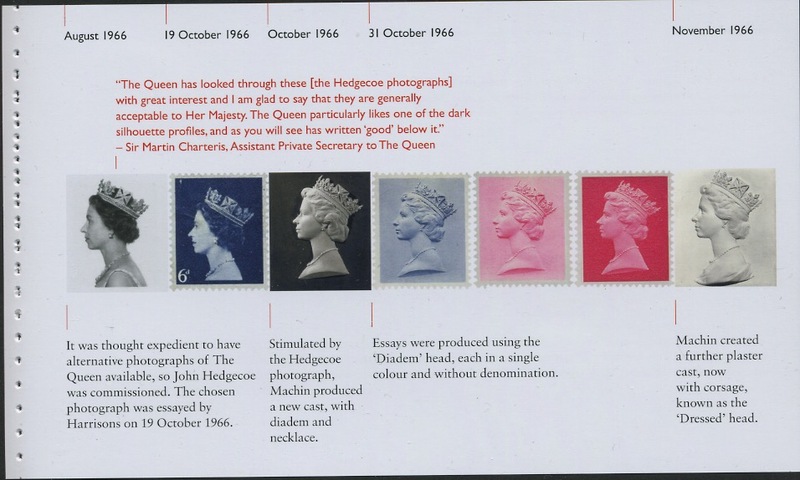 But we now know that the stamp on the mini-sheet has phosphor bands which must be applied by litho. § See comments. If these new PSB panes are gravure then this is also a new stamp, as SG2955 is litho by Cartor. The majority of these stamps are very good matches to the originals. 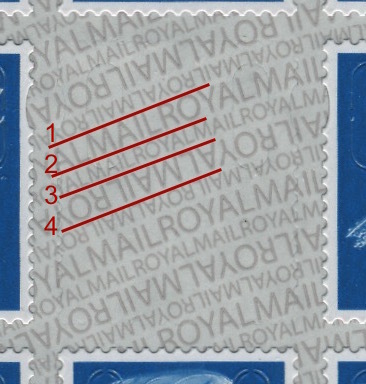 I've added SG numbers numbers in the table above, although some of the original stamps exist in several variants so other numbers may also be relevant. There are four stamps with security printing: 1st class red (not deep scarlet) coded M17L and MPIL, MMIL*, and 1st class deep scarlet MSIL, and the £1 ruby (magenta) M17L MPIL. 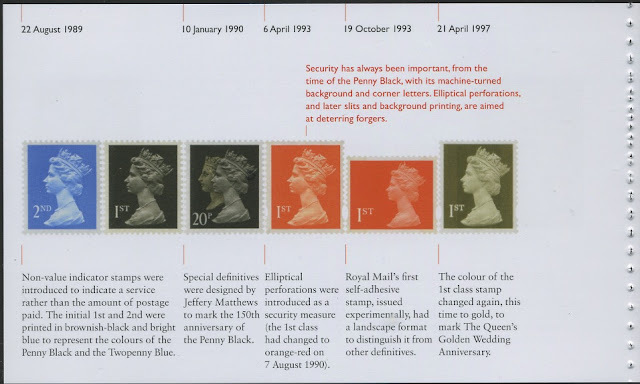 The three other new stamps are the £1 gold foil embossed (with± and without phosphor bands), the 1st class black with elliptical perforations, and the 1st class orange, landscape format, on gummed paper rather than self-adhesive*. 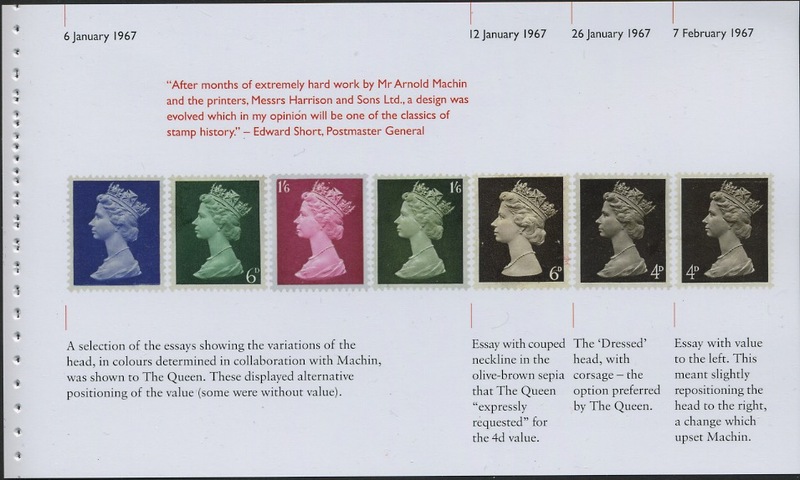 This makes a total of 7 new stamps although specialists will identify some subtle and not so subtle differences from the originals. 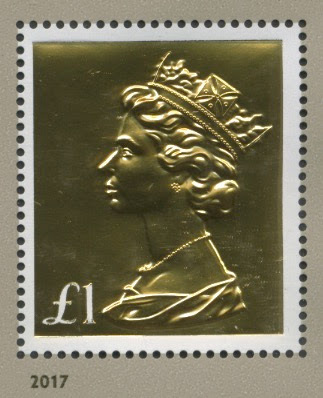 The Millennium stamp, for example, has the head placed much further to the left than on the originals, aside from being in two slightly different shades. 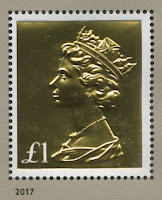 ± Contrary to previous observations the £1 gold stamps from both sources do have phosphor bands. But we still don't know for certain what process was used. BM has pointed out that the embossing must be the final operation after all printing (including phosphor) and application of gold foil. 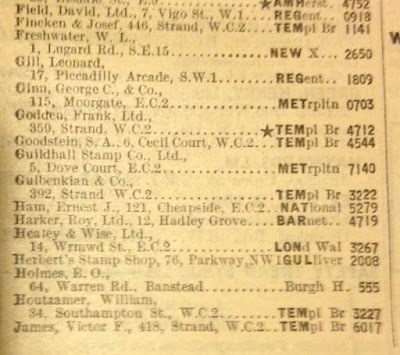 He suggests that a third party printer may have been involved with this operation, as with the recess printing by FNMT on the Long To Reign ms.
*These two are unlikely to be allocated individual numbers in the SG Great Britain Concise catalogue as they only exist from the miniature sheet. "comes in an exquisite specially-created display case together with a silver Machin medallion which was handmade in the UK and has been struck in solid sterling silver, weighing 97grams (diameter 60mm). In addition, centrally placed in the lid of the case is an original 4d stamp as replicated on the Golden Anniversary Celebration Miniature Sheet". As this is an edition of only 500 we don't know what supplies will be available for Royal Mail online and telephone buyers when it is issued. We will have a few for those who want them. 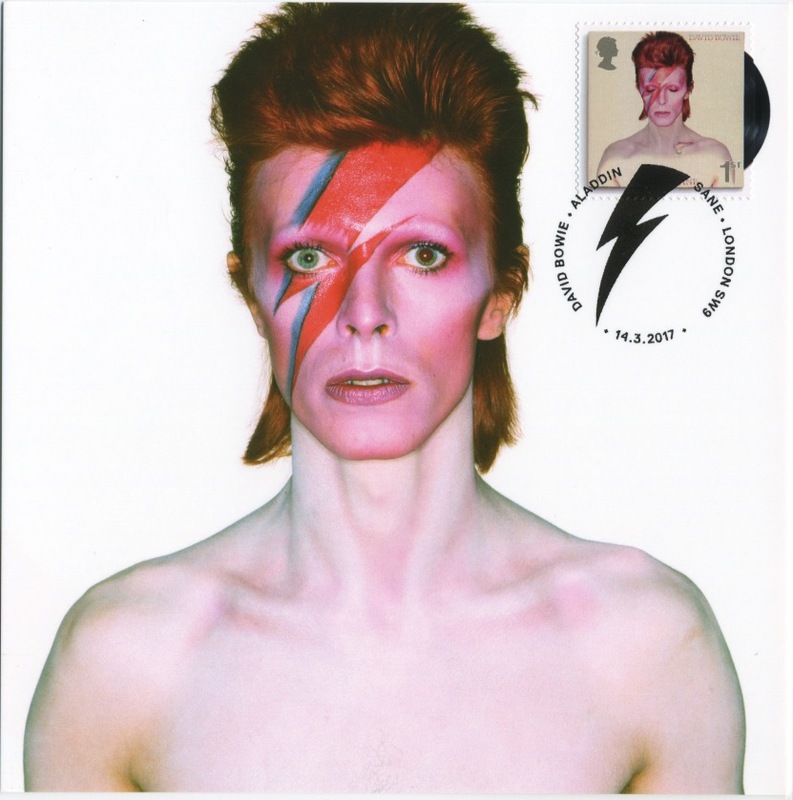 We have been assured that the stamps they contain are the same. The PSB, MS and retail booklet will be added to our webshop shortly. We will also have some first day covers for sale available for pre-order. Customers ordering these new products should not choose immediate payment by PayPal but choose 'Pay by Cheque' and await our return. Thank you for your patience while we have been processing orders and restocking the latest new issues. We have now reopened the webshop. 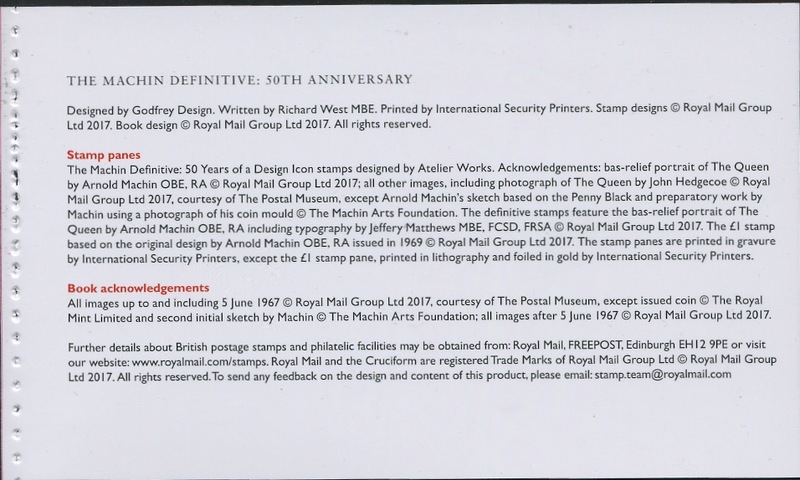 A number of new Machin security stamps have been received since we closed, and we have also added the forgery of the £1 brown, and the 1997 trial printings by Courvoisier (only a few of those). 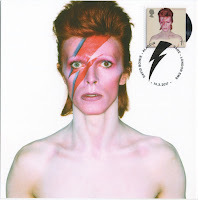 Also new are maximum cards of the Songbirds and David Bowie - we haven't seen any Bowie maximum cards anywhere else - and the Thistle and Post Office railway digitally-printed Post and Go stamps. Our Machin Security Checklist has been updated to include the latest stamps listed above. Version 1.5.7 dated 10 May is now available from the usual download link. Current versions are available here from Dropbox. When I first reported the use of the second type of security backing paper (SBP2) I showed that if the backing paper was re-reeled and used inverted, the format of the text would be different. "I shan't be adding any further on this for the present. It's probably not worth separately listing both types on the same stamp as a sales option in our webshop, certainly not at present. " See full text on later blog post here. Now an eagle-eyed customer (thanks Rolf) has observed that the two different formats have already been used - and nobody else seems to have noticed, probably because at this stage no individual stamp has appeared on both types. 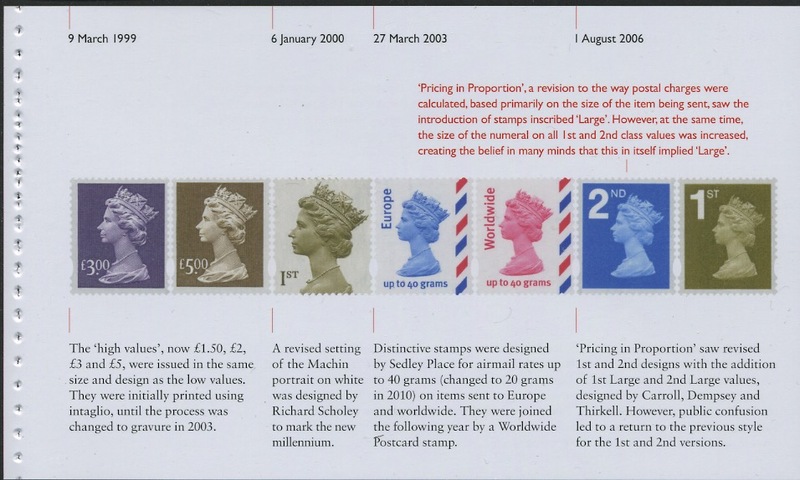 So aside from the 2nd class business sheet, all the thin-paper stamps (counter and business sheets) have been printed on what I described originally as an 'inverted' SBP2; and all the thicker booklet stamps have been printed on original (upright) paper. 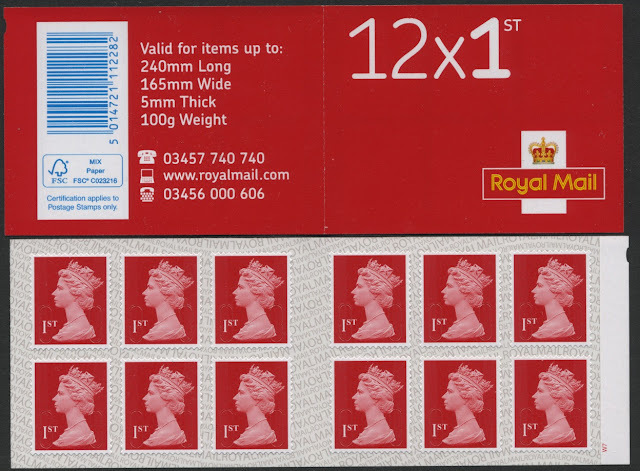 As 'Trelantis' mentions in a comment on last week's post about the 5p and 20p sheet stamps, the 1st Large business sheet and 12 x 1st booklet, both M17L, have now appeared and will be listed on our webshop when it reopens later today. The iridescent printing on the business sheet is not very strong, being similar to the M16L booklet issued earlier. 12 x 1st booklet M17L (norvic 2936a.7) packing date not yet known. Cylinder numbers W7 (red), W1 (iridescent), W2 (phosphor).